Tribute by Martin Grelle ~ Painting this piece meant a lot to me. It is my tribute to all those who have given their lives for this country, whether they are or were military or not, and to all those who have risked their lives to serve and protect us as police, , firemen or emergency medical personnel - as well as a tribute by the soldiers in the painting to their fallen comrades. It is a western genre painting because that's how I best express myself. The cavalrymen are in the 1880's uniforms appropriate to the western frontier. 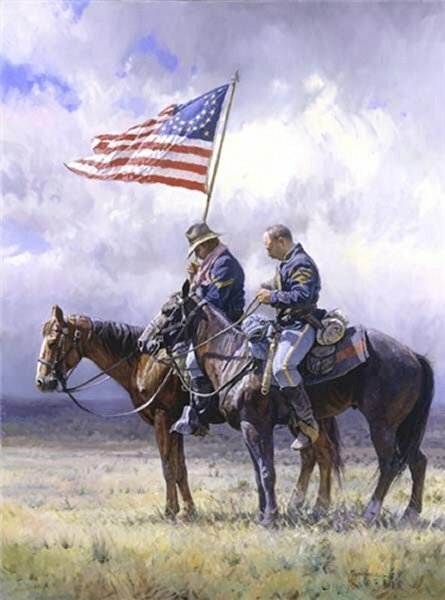 The flag is one that was carried by the cavalry and is actually a guidon, not the United States flag of that period, so it has alternating red & white stripe and the blue field of stars, but the stars are gold instead of white. I felt it was more appropriate historically for this time period, and yet still has the impact of the traditional Red, White and Blue. The soldiers would probably be from two different companies, as their horses are not the same color. I'm sure there were exceptions, but usually horses were distributed to individual companies according to their color. The soldier closest to the viewer is a first sergeant, represented by the rank chevron on his arm, as well as the yellow stripe down his pantsleg. The soldier bearing the flag has a corporal's chevron.